Ellen East is a certified professional coach and 200RYT yoga instructor who specializes in helping people reach their full potential with intention and purpose. Ellen has practiced yoga for more than 25 years, and started a daily practice a few years ago when she left the corporate world. In 2017, she participated in 200YTT training at 90 Degrees Yoga in Greenville, SC, studying under Allison Cross. Ellen’s yoga training is in the lineage of Paramahansa Yogananda, an Indian yogi and guru who introduced millions of Indians and westerners to the teachings of meditation and Kriya Yoga. Known for her calm voice and manner, Ellen loves teaching Vinyasa Flow, Strength, Balance and Flow, and Gentle classes, and enjoys a collegial classroom, often bringing in humor to make a point or teach a posture. She makes her classes accessible to beginners and advanced yogis alike, offering choices and props to ensure everyone gets a good experience. Ellen enjoys adding meditation, yoga nidra, yoga mythology and relevant readings to her classes. Ellen received her certification in health coaching through Institute for Integrated Nutrition™ and received training in life and career coaching through the Center for Coaching Certification. As a health, life and career coach, Ellen helps clients set goals, stick to their plans and achieve their dreams. 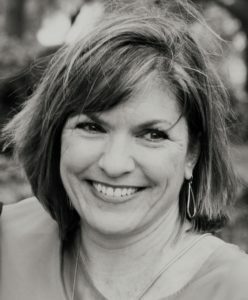 Before becoming a yoga instructor and coach, Ellen spent more than 30 years in corporate communications, public relations and journalism, most recently as Executive Vice President and Chief Communications Officer of Time Warner Cable in New York, N.Y.
She lives in Hartwell, Georgia, with her husband David and sweet Australian shepherd, Annie. She has two grown children, and enjoys yoga, wellness, nutrition, entertaining, crafting and mentoring young adults.